afrol News - Gambia coup "only matter of time"
Gambia coup "only matter of time"
afrol News, 11 November - For the second time in a year, Gambian President Yahya Jammeh claims to have revealed a coup plot against him, leading to mass arrests. Observers hold a real coup is "only matter of time" as President Jammeh dreams of a royal title. This week again, the Gambian government announced the arrest of a large group of security officers allegedly plotting to overthrow President Jammeh. At least 11 security officials were arrested, including Lewis Gomez, director of internal security in The Gambia's feared National Intelligence Agency (NIA). The wave of arrests of high officials comes only four months after the last trial against top security officials. Then, eight officials, including The Gambia's former army chief and former deputy and intelligence chiefs were sentenced to death over an alleged coup plot. The last coup plots follow a series of earlier plot allegations by President Jammeh, many of which have been described as false. Earlier plot allegations were abused to exterminate the country's independent press and opposition. NIA officials were reported to torture and kill outstanding members of the press. Sources from within The Gambia tell afrol News that, while the current coup plot allegations cannot be confirmed, there is growing concern among the Gambian army and intelligence about President Jammeh's increasingly totalitarian rule, and about "the mental health of the President." The sources hold that it would be "only matter of time" before some concerned group would mount a successful putsch. The belief in an upcoming coup was so strong that several top officials were believed to compete for coming leadership positions. Putschists could also count on the silent compliance and support from The Gambia's neighbour states, in particular Senegal, which were increasingly embarrassed by President Jammeh's dictatorship, the same sources held. Indeed, President Jammeh has demonstrated decreasing leadership capacities over the last few years, taking on totalitarian powers, succumbing to megalomaniac dreams and growing increasingly paranoid about his grip on power. Lieutenant Yahya AJJ Jammeh came to power in a military coup in July 1994. The thus 29-year-old skinny and insecure officer had his little education from the armed forces of The Gambia and his reading abilities have often been questioned. To hide his low skills and poor education, President Jammeh for the last years has collected titles - most proving to be false - a doctor, scholar, elder and religious leader. 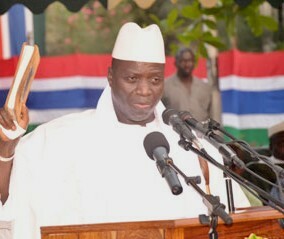 Mr Jammeh now insists of being called "The President, His Excellency Sheik Professor Alhaji Doctor Yahya Jammeh." Serious doubts to his leadership were posed when the Gambian dictator announced he was able to cure AIDS and other diseases. He still leads a presidential AIDS treatment programme, using herbs, bananas and prayers. Recently, he even embarked on a nation-wide witch-hunting campaign, forcing almost 1,000 alleged witches to drink a special cure, which according to Amnesty caused the death of at least two persons. But the major concern about President Jammeh's leadership is focused on signals the Gambian leader may want to formalise his desire to stay in power for the rest of his life. A campaign for President Jammeh to take on royal powers, in addition to signals that multi-party election are soon to cease, are causing concerns among Gambian high officials, knowing they may very well be the victims of the next purge. Indeed, a campaign by local chiefs in The Gambia - all of whom are dependent on President Jammeh's goodwill - is calling for him to take on the royal title of King of The Gambia. "The President has brought development to the country, and for that he deserves to be crowned King of The Gambia," Junkung Camara, paramount chief of the western region of Foni Brefet, told the US news agency AP this week. In The Gambia, the campaign is gathering momentum, as local chiefs gather support for the coronation of President Jammeh. Opposition sources hold that the campaign has been initiated by title-loving Jammeh himself, to check whether a royal title would be able to gain popular support in the impoverished country. The presidency has made it clear that President Jammeh wants to seek a lifetime leadership og the country, being a royal title or a lifetime presidency. Mr Jammeh on Friday told government officials, paramount chiefs, and religious leaders that elections were an evil for African countries, naming the examples of Somalia and Guinea. "But it is left to you [Gambians], whatever you decide is what we will do," President Jammeh told party loyalists, indicating there may soon be a referendum over his lifetime presidency or coronation. There is no doubt the Gambian President is serious about changing the constitutional order of the country. According to a press release from the presidency released on Friday, Mr Jammeh "will not campaign in the coming 2011 election because he has initiated many development projects in the country that will convince the people to vote for him." The announcement President Jammeh will not run a campaign during next year's elections is seen as yet another sign that a one-party system or even royal system is being prepared, according to the exiled Gambian media 'Freedom Newspaper'. Several leaders of the ruling APRC party have called for "no elections" in 2011, the paper reports this week. afrol News sources in The Gambia confirm that campaigns for President Jammeh's lifetime rule are gaining momentum in the country, but say that these developments are even further increasing concerns among top Gambian officials already sceptical towards Mr Jammeh. Coup plans are widely extended, they confirm.